QuickBooks Pro 2005 gives you improved tools and customization options that make managing your business finances even easier. 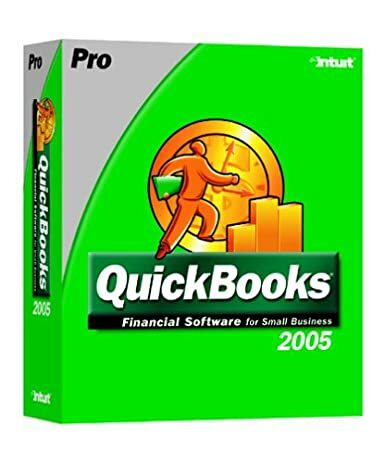 QuickBooks: Pro 2005 gives you all the features of QuickBooks Basic plus improved advanced tools and customization options to help boost efficiency and improve organization. Features: 1. Easily pay bills, print checks, and track expenses 2. Improved! Manage customer payments more quickly, including over and underpayments 3. Improved! Manage Payroll and Direct Deposit 4. Easily Transfer Data To and From Microsoft Excel 5. Improved! Easily create and print letters/envelopes in Microsoft Word 6. Improved! Works with Microsoft Outlook and 325+ popular software applications 7. Easily Customize and Choose Professional Designs for Forms 8. Improved! Easily enter downloaded banking or credit card transactions 9. Improved! Easy-to-use Help Features 10. 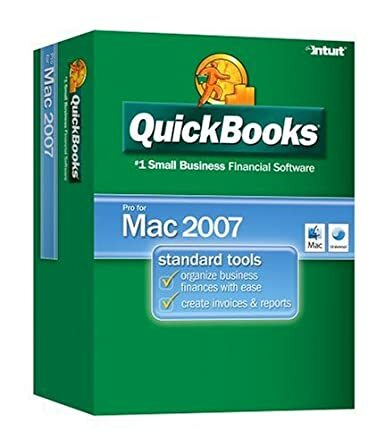 Automatically create a budget and project cash flow Also: Easily add up to 5 simultaneous users (requires additional purchases) Requires multiple copies of QuickBooks Pro or Premier Edition 2005 and local area network. Simply buy copies for the number of users you have or save with the 5-User Value Pack. Add-on services require subscription, EIN and Internet access for certain features including tax table updates. Transaction fees charged for direct deposit. Excel integration requires Microsoft Excel 2000, 2002, or 2003. Microsoft Excel sold separately. Word integration requires Microsoft Word 2000, 2002, or 2003. Microsoft Word sold separately. 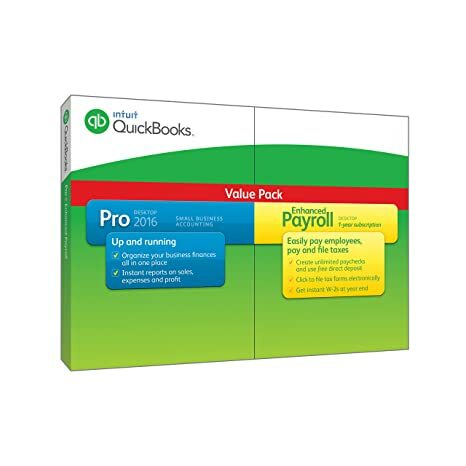 QuickBooks Pro Small Business Accounting Software with Enhanced Payroll helps you organize your small business finances and payroll all in one place. Easy to set up, learn and use. No accounting knowledge is necessary and you can quickly import your data from a spreadsheet. Easily create invoices and get paid faster with online invoicing and manage expenses. Plus, easily pay employees, calculate and file payroll taxes. Have questions? Step-by-step tutorials show you how to create invoices, record expenses, pay employees, file payroll taxes, get instant W-2s at year end, and more. Includes a 60 day money-back guarantee. QuickBooks Pro can easily organize your finances, identify ways to save money and manage your business better. Stay on top of it all with important information in one place. Create invoices, track payments and manage expenses. Get business insights with access to over 100 reports. This is an upgrade to 2004. 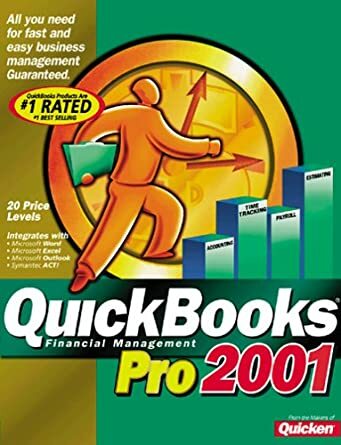 You must already have Quickbooks on your computer. This software will upgrade it to 2004. 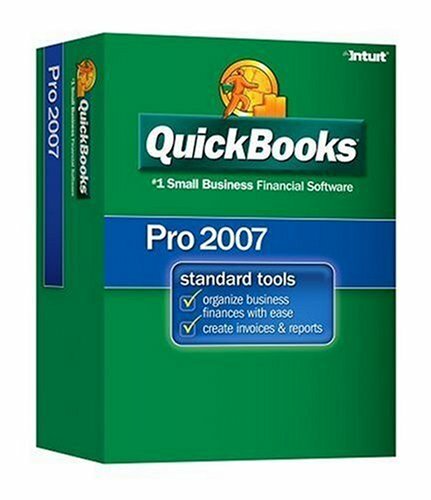 QuickBooks: Pro Edition 2006 is the leading choice of small businesses for fast and easy financial management. Track money going in and out of your business more accurately. Routine tasks like payroll, invoicing, tracking bills and check-writing can be done in minutes instead of hours. With the click of a button, you can see past-due invoices or overdue bills. Or instantly see your entire business relationship with any customer or vendor. If you ever want to get in touch with them, all the contact information you need is right at hand. Also at your fingertips are invaluable customized reports. These reports let you slice data any way you wish. You’ll see what’s really going on with your business in a way never before possible. Isolate expenses. Identify your largest customers. Track your areas of biggest growth. The possibilities are endless. And when you need to share your data, you can easily import and export from Microsoft Excel and a number of other programs. 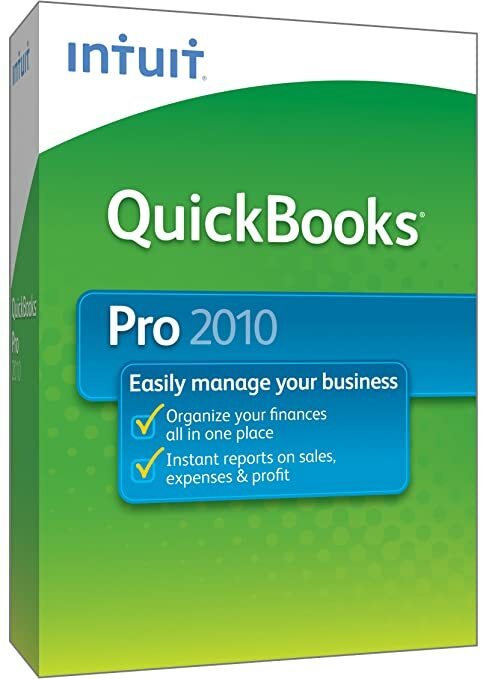 QuickBooks Pro helps you enhance your professional image as well. You can customize and print professional forms. Easily add graphics and personal messages. Seamlessly print letters and envelopes with Microsoft Word. QuickBooks gives you the time, resources and knowledge you need to grow your business like never before. 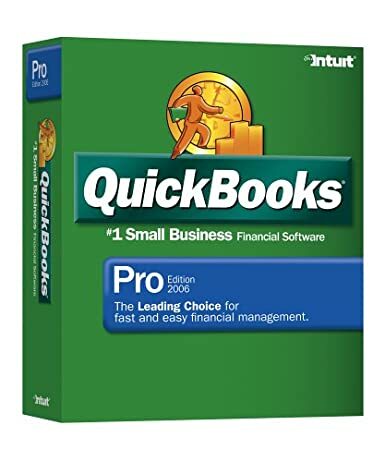 QuickBooks Pro 2016 Small Business Accounting Software helps you organize your business finances and accounting on a Windows PC. Easily get set up, learn, and use. No accounting knowledge is necessary and you can quickly import your data from a spreadsheet. Easily create invoices and get paid faster with online invoicing and manage expenses. Get 100+ financial accounting, sales and tax reports in one click. And, QuickBooks accounting software ensures you’ll have reliable records for tax time. Have questions? Step-by-step tutorials show you how to create invoices, record expenses, and more. Includes a 60 day money-back guarantee. 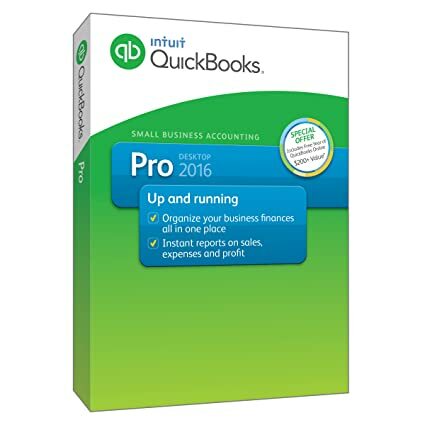 Special Offer: Your purchase of QuickBooks Desktop Pro 2016 Small Business Accounting Software includes Free Year of QuickBooks Online. 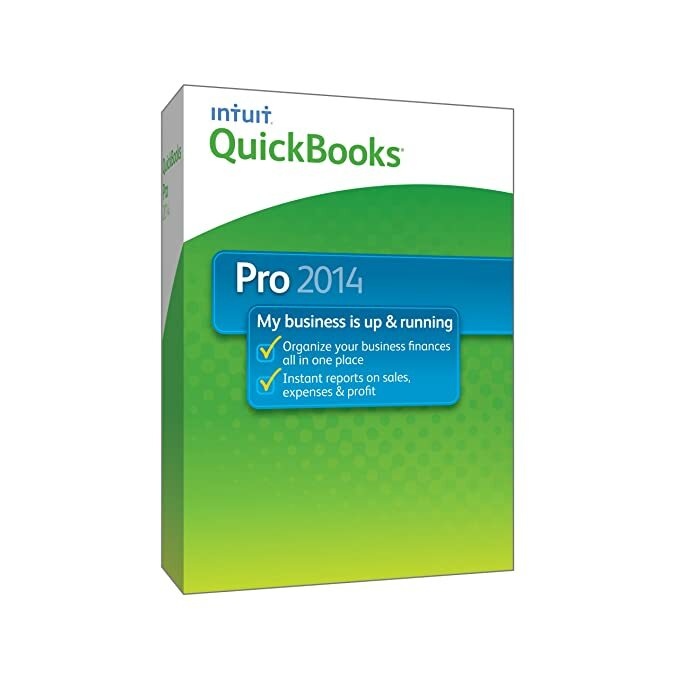 Intuit QuickBooks 2001 Pro is a complete accounting and payroll product for small businesses. Extensive tools allow you to manage all financial aspects of your business. Store and track checking accounts, credit cards, and accounts payable/receivable. Bank and pay bills online, create customized invoices and statements, print forms such as 1099s and W2s, and more. Over 100 customizable instant reports and graphs provide an overview of your business at any time. Advanced project reports include job administration; job profitability; job estimates vs. actuals; progress billing; and time reports by name, item, and activity. Organize your memorized reports into groups that make the most sense to you. Keep your place on reports with new QuickZoom, which allows you to go back to exactly where you were in the report, instead of to the top. QuickBooks 2001 Pro online billing lets you e-mail invoices and get paid online, which saves your customers time and allows you to get paid faster. You also can e-mail and fax invoices and estimates directly from QuickBooks. Create up to 20 different price levels for products and services, such as assigning default prices for wholesale, retail, or best customers. Customize reports to look the way that you want. Sort the information in any column or change the order of columns in most reports. 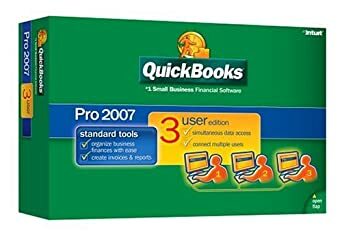 QuickBooks 2001 Pro offers improved time-sheet printing, advanced job costing, and time tracking. 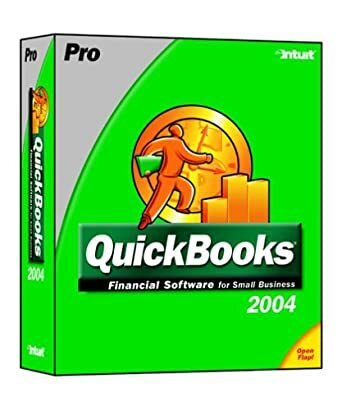 These and many other features make QuickBooks 2001 Pro a fast and easy way to manage your business. </div> <h3 class=”productDescriptionSource”>Product Description</h3> Offers advanced tools for businesses that want to manage their finances more effectively and efficiently. Includes tools that help boost productivity and give you more control of your spending, your data and your business forms and much more!